Thanks to a new reader, I found out that October is Queer Romance Month. The kick-off was yesterday so you can go over to Joyfully Jay and read all about why queer romance is better than cats. Yes, those cats. The furry kind. It's very funny. As a very new reader of queer romance myself, I don't have a ton of impressive insights and recommendations like the folks writing over at the Queer Romance Month blog do. But yesterday I saw KJ Charles post some chocolate chip cookies that spell out QRM on Twitter. So then I was like, oh we BAKE for QRM? Well, that I can do! 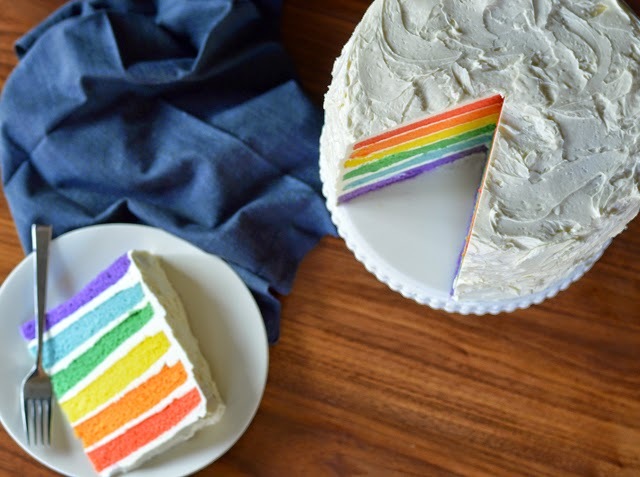 As it turns out, Queer Romance Month is a pretty good excuse for cake. It's a celebration of queer-identified authors and queer-writing and queer-supporting folks. Celebrations require cake. As Julia Child said, "A party without cake is really just a meeting." No one likes meetings, but everyone likes cake. 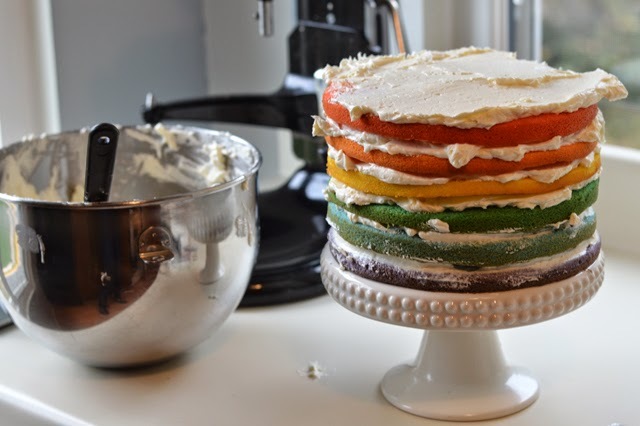 I'd been wanting to try making one of these rainbow cakes forever, but I'd never had an appropriate occasion. It's actually pretty easy. 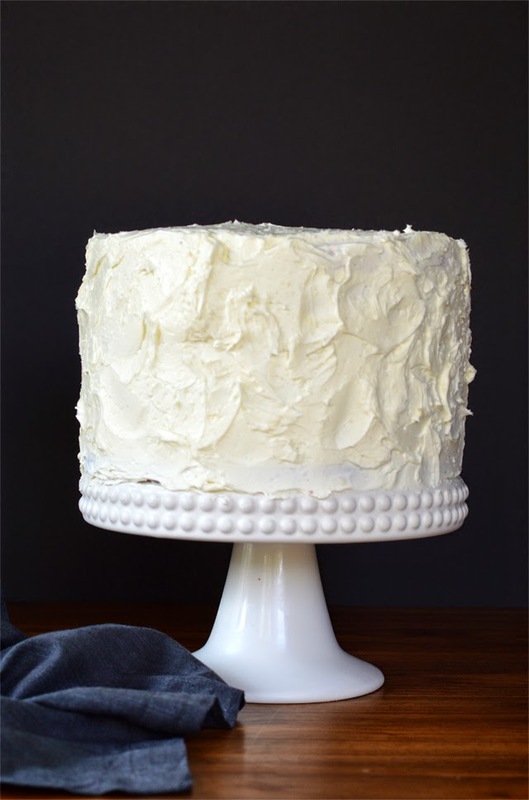 I started with this white cake recipe from Smitten Kitchen (remember the rule folks: if you're going to screw around with a recipe, make sure you start with a good one). The reason was that it makes exactly 9 cups of batter so I was able to make 6 equal layers using 1 1/2 cups of batter for each cake pan. 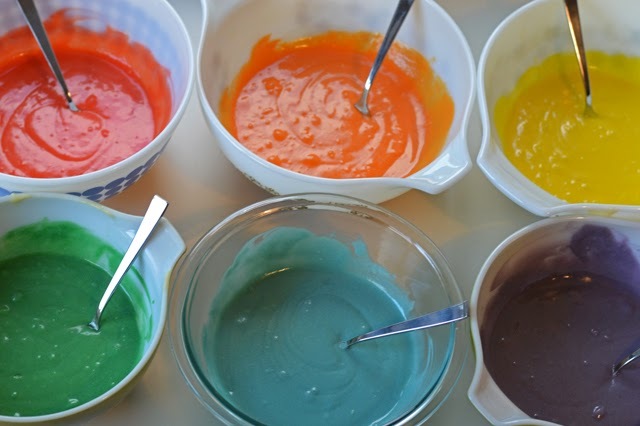 Then I added food coloring to each portion of batter to turn them all the colors of the rainbow. I felt like a mad scientist (complete with Coke bottle glasses and lab coat--okay, not really) as I mixed colors to get just the right shades. For the record, I use Americolor gel paste food coloring from the baking supply store (or online). They have dozens of colors and they're more concentrated than the ones you buy in the grocery store. I was just too lazy to drive all the way to the baking store to buy orange and purple. The layers only take about 15 minutes to bake since they're so thin, but I did have to bake them in two batches because I only have 3 cake pans. Then I made a metric ton of Swiss Meringue Buttercream and frosted it all up. Voila! 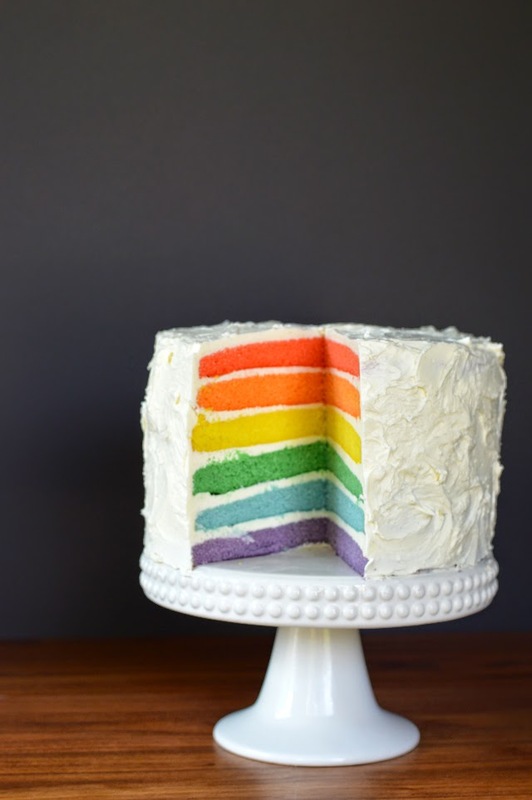 Queer Romance Month Rainbow Cake! Now for the really important stuff. The first few posts up on the QRM site are excellent: intelligent, informative, entertaining. I'm sure the rest of the month will follow suit since the line-up looks stellar. I'd highly recommend subscribing, even if you think you might not have any interest in queer romance. If you'd asked me before a few weeks ago, I wouldn't have been quite so excited about this. I didn't know any better. I thought heterosexual romance was for heterosexual people and queer romance was for queer people. But I feel pretty stupid about that now. Since I read Glitterland (my review is here), I've read a steampunk and an historical short story and they've all been terrific reads. So don't be like me. Don't wait until someone literally puts a book in your hands to try out some of these great recommendations. Really, if you're not reading queer romance in whatever subgenre you like best, you're missing out on a lot of wonderful love stories. Omg - I want this cake! Right now! 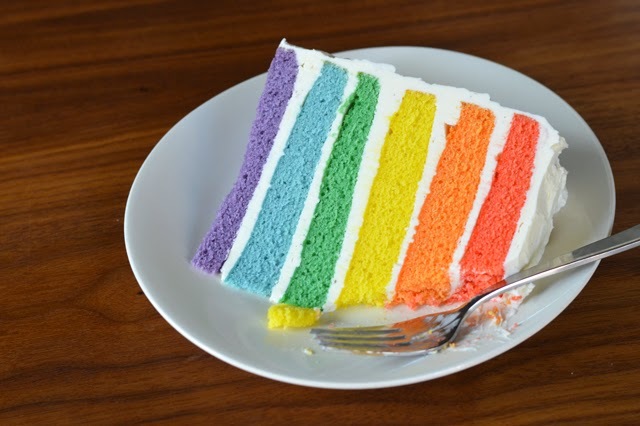 *ahem* Anyway, thanks for the post supporting QRM & the beautiful cake, even if we only get to look at it! This cake is WOW! You are so talented. I actually bought a cake today because of this post--I got so hungry for one. This cake is gorgeous! And now I need dessert. :) So glad you enjoyed the story! And if you're looking for a brilliant m/m historical, KJ Charles' Edwardian romance/mystery, Think of England, is so witty I had to force myself to stop highlighting lines as I was reading. It doesn't count as highlighting if you've underlined most of the book, I think.